Please find us at our new website. We met the lovely poet and disability and arts (self-)advocate Khairani Barokka who came to our AGM. We are delighted that she will be performing at the award-winning Betsey Trotwood pub to celebrate the debut of Bare Lit Festival 2016! Second Generation Poets in Exile. We wish her all the best!! and hope a few of us will manage to get to see her performance! Khairani Barokka (b. 1985) is a writer, poet, and interdisciplinary artist. She is also a practitioner of think/do advocacy in the arts, particularly on the ways in which innovation in storytelling can increase inclusion and access for and by disability cultures and feminisms (both of which she is happy to be a part of). Born in Jakarta, Okka works, teaches, and is published internationally, in print and online (see WRITING for recently published and forthcoming work). Her lectures, performances, workshops, and/or projects have been presented extensively, in India, the US, Australia, Malaysia, the UK, Austria, Germany, Singapore, and her native Indonesia. She has a masters from ITP at NYU’s Tisch School of the Arts, as a Tisch Departmental Fellow, working on participatory, interactive art, literature, and social issues storytelling. Her BA (High Honors, College Scholar) was from Middlebury College in Sociology/Anthropology. Okka is the writer, performer, and producer of a hearing-impaired accessible solo show, “Eve and Mary Are Having Coffee” (with a grant from HIVOS as main sponsor), which premiered at Edinburgh Festival Fringe 2014 as Indonesia’s only representative. Previously, she pioneered the production of the first live-streamed spoken word shows in Indonesia, involving cross-national collaborations, with a focus on social justice/disability justice. As an independent scholar, she is a member of the International Federation for Theatre Research (IFTR), and has presented at international conferences, festivals, and as a two-time TEDx speaker (Jakarta and Youth@Chennai). Okka was profiled in UNFPA’s book “Investing in Young People in Indonesia: Inspirational Young Leaders Driving Social Change” (2014) for raising awareness of disability issues and perspectives through art and writing. She has also been featured widely in national and international media, among them multiple ABC Australia appearances (radio and television), RRR (Aus), The Hindu (India), The Times of India, The New Current (UK), and all major Indonesian newspapers and media including National Geographic, Esquire, and BBC Indonesia (see PRESS for complete list). Okka was most recently Artist-In-Residence at Rimbun Dahan (Malaysia, 2014-15) for 6 months, where she worked on writing projects as well as using text in mixed media works. She has also held residencies at Vermont Studio Center (US, 2011; with a grant for poetry, as first Indonesian writer-in-residence), Tutti Arts (AUS, 2013), the EQUILIBRIUM Project at Sandarbh (India, 2014), Jatiwangi Art Factory’s Village Video Festival (Indonesia, 2012) and was Emerging Writers Festival’s (AUS) Inaugural International Writer-In-Residence for 2013. Her first book as sole author, a poetry-Braille-art production entitled “Indigenous Species” (also to be made available in non-Braille versions), will be out in late 2016 with Tilted Axis Press (UK). “HEAT”, an anthology of Southeast Asian urban writing co-edited with Ng Yi-Sheng for Buku Fixi Publishing (Malaysia), will be launched at the London Book Fair in 2016. In September 2015, Okka began a PhD by practice in Goldsmiths’ Visual Cultures Department, on an LPDP Doctoral Scholarship. She continues her work at the intersections of writing, art, disability cultures and participatory narratives with a long-awaited project–it’s been given the enticing codename “Project A”, as lacklustre codenames are significantly underrated as a method of approaching secret missions. This is reposted from The Conversation which uses a Creative Commons Attribution NoDerivatives licence and with kind permission from Kate Ellis. We think this fits in very well with what was voiced at the panel on disabled women at Feminism in London. The sometimes uneasy relationship between feminist groups and disability activists was highlighted last weekend, when online Australian feminist group Destroy the Joint (DTJ) blocked and banned a number of high-profile Australian disability activists, claiming the women were in breach of their rules. DTJ had called for submissions to the hashtag #beingawoman on its Facebook page, sparked by a Buzzfeed article featuring both lighthearted and serious tweets reflecting on modern womanhood. Several disability activists began posting their experiences, only to be deleted for being “repetitive, circular and off topic”. DTJ banned the commenters from its Facebook page, for “spamming this post and page with a large number of obvious half truths and distortions”. Let us begin with a belated and unreserved apology about the way we have handled the comment moderation in this instance [the #beingawoman incident]. We acknowledge we can always be more inclusive. We are constantly discussing ways we can achieve this and no woman living with disability should be excluded from this page. Anyone who has been banned as a result of this will be unbanned. Please email jointdestroyer@gmail.com so we can be thorough about this. It has always been our mission to include everyone and Counting Dead Women includes all women who have been killed as a result of gendered violence. While it was a disappointing weekend for those of us who identify as both disabled and feminist, the gaffe has prompted a reflection on the ways disability politics are essential to feminist politics. Disability is a feminist issue and the silencing of disabled voices and experiences does not further the feminist cause. While the women posting on DTJ may have experienced gendered oppression, such as domestic violence, they are simultaneously affected by ableism. American law professor Kimberlé Crenshaw described the ways minority groups experience multiple and overlapping oppression as intersectionality in 1989. Low levels of education relegate women with disabilities to lower echelons of society, limit their access to information and their ability to interpret it, limit their life choices and limit their ability to achieve financial and living independence. Women with disabilities are also more likely to suffer domestic violence and sexual assault. It is vital for feminism to focus on the impact of sexual violence, but how can we do that properly if we don’t acknowledge that 90% of women with an intellectual disability have experienced sexual assault? Reproductive rights are core to feminism, yet they cannot be discussed without also hearing from the women whose impairments have led to doctors and carers deciding – without their permission – they must be sterilised in order to prevent the physical aftermath of sexual violence becoming a “problem”. Just today, I read an article about two parents with cerebral palsy who have been “allowed” to keep their child. The dehumanisation of women with disabilities is appalling, but even worse is the way these issues are marginalised even within feminism. In Integrating Disability, Transforming Feminist Theory (2002), Rosemarie Garland Thomson explains how both women and people with disabilities are considered “deviant and inferior” within cultural discourse and subsequently excluded from participation in public and economic life. Other disability theorists suggest the reason women with disabilities have been excluded from mainstream feminist circles is because they are a reminder of vulnerability and lack of control, identities feminists have traditionally sought to reject. Whereas disability was once thought of as an individual’s medical problem to overcome, following the work of disability activists such as the late Stella Young we are increasingly coming to recognise disability as a problem related to inaccessibility and negative attitudes. Disability, like gender, is a social construct. Back in 1988, disability theorist Susan Wendell called for a “feminist theory of disability” as a way to move forward in both disability politics and feminist theory. Wendell argued the oppression of disabled people is closely linked to the cultural oppression of the body. She believed a feminist theory of disability would “[liberate] both disabled and able-bodied people”. We are all women, and the issues we face are issues faced by mainstream feminism, not by individuals or minority collectives. The incident illustrates an important truth: being aware of intersectional oppression in 2015 should not be an optional “extra”, but fundamental to any social justice movement. Correction: a previous version of this article contained a paragraph stating that criticism had also been also been levelled at DTJ over allegedly failing to include women with disabilities in their regular count of women who have died as a result of domestic violence or abuse. While that criticism exists, it is not substantiated. If I had a pound for every time someone asked me this question or a less polite version such as what’s wrong with you? Have you always been like this? Were you born in a wheelchair? I would be a millionaire. Now I know people are curious about disability (even if I don’t really get why) but do we really need a superhero like origin story can’t we just exist? While I generally humour the disability questions, providing people are politely I’m not going to lie it is irritating. However recently Ive begun to realise all of these ‘origin’ questions are intensely personal and potentially traumatic. While seemingly most of the questions have yes or no answers in reality the conversation doesn’t stop there. For the majority of disabled people it’s either unclear when we acquired our impairments or the result of a traumatic experience. Meaning the answer to ‘have you always been disabled?’ becomes no or I don’t know. These answers invariably lead to more questions or an expectation of an explanation. I was trying to think of similarly personal question and the best I could come up with was why did you get divorced? Whilst some would ask the majority would let the affected party direct the conversation. Despite having my impairments as long as I can remember and therefore the questions about my impairment for almost as long, until recently I didn’t really feel like I had any option but to answer. In part feeling compelled to answer questions about my impairment comes from growing up in systems which depend on that information to judge my eligibility for support combined with me being the first ‘severely’ disabled person in many of the environments I’ve accessed. However I now question how that information being disclosed to all and sundry has aided me. Yes as someone with support some people need to know what support I need but is do impairment labels or my history communicate my needs… Not fully. I suspect it has taken longer for me to take ownership of my right not to disclose my ‘origin’ story because I’m a woman as often the refusal to disclose information is often seen as being aggressive regardless of how polite the denial. I’m not against talking about impairment or disability in fact if we talked about them more maybe the novelty factor would wear off, however I believe that disabled people should have control over their own story and who they disclose it to. Surely there are much more interesting conversations to be had. 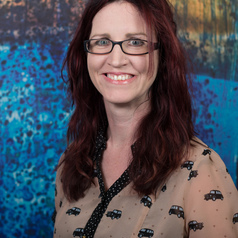 Zara Todd has been involved in young peoples and disability rights since she was 12 and has worked both in the UK and internationally trying to increase the voice of young disabled people. Zara is currently chair of Inclusion London, a Deaf and disabled people’s organisation supporting Deaf and Disabled people’s organisation in London. She is an active member of the European Network on Independent Living running several trainings for young disabled people from across Europe. 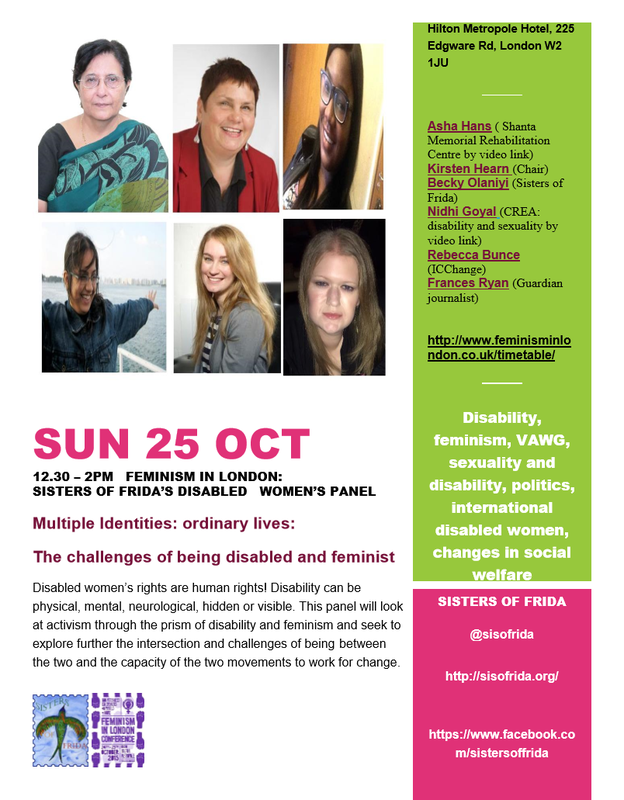 We were asked to organise a disabled women’s panel at this year’s Feminism in London Conference in October. A big thank you to Lisa-Marie Taylor, FIL’s organiser, for inviting us! We did some publicity by having a stall and we ‘re grateful to Annabel, Zara, Jacqueline and Sophie for helping us with the stall! Real Media came to do do a short video feature on it – many thanks! Thank you all for having taken part in the event! In anticipation of this year’s Feminism In London conference (October 24-25), Alicen Grey talks with Becky Olaniyi about disability, feminism, and the challenges and lessons of being an activist at the intersection of identities. See the rest of the interview at the Feminist Curent. Becky is the youngest member of our steering group but she’s a brilliant speaker. Its not too late to get tickets for the workshop. And if you have difficulties paying, just let them know.